From December 4th through the 9th we had the most colourful and powerful youth camp that we ever had. We had all our neighbouring churches represented, and also so many people who never attended church attending! We had a gospel rapper and also youth from our church dancing to local gospel tunes. Then was also the message and the power! We saw so many miracles and wondrous things. Faith righteousness and identity in Christ were the major lessons we were teaching and we made sure everybody understood. On Sunday, many people flooded in the Church. There was no room for everybody, so some stayed outside as we concluded the camp. We prayed for everybody. There was a lady who had never attended our church who was powerfully delivered! Praise God she got born again!! Thirty-five people got saved and many got baptized in the Holy Spirit and spoke in tongues immediately. I also demonstrated the laughter in the spirit and we all laughed that Thursday evening so much that some were carried home still laughing. I must have picked up this manifestation gift from the chops of Papa Dave. A lot happened in the camp and I can�t type them all. But we are glorifying the Lord for all He has done for us and through us. God bless FMIN. 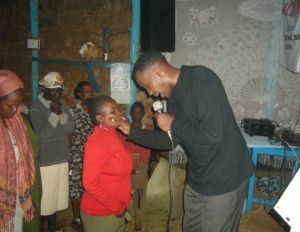 David Remi is a gifted minister to youth. He is the son of Partner Margaret Remi Thomas and Brother Thomas who opened the nations of Africa to Dave Duell. David Remi is named after Dave Duell. It is so exciting to read your reports, David! Your zeal and energy for expanding God's kingdom inspires us all.